The requirements for organic eggs are very specific. 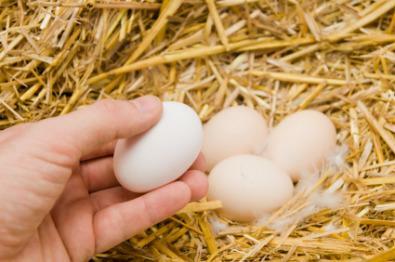 It takes time and effort to become a producer of anything labeled organic, including eggs. The United States Department of Agriculture (USDA) is the agency in charge of organic licensing in the United States. While the definitions and requirements for organic labeling may be similar in other countries, they are often slightly different. Always check to make sure what your country's definition of organic is. The chicken is not given hormones. The chicken does not get antibiotics routinely, if at all. No pesticides or other chemicals are used in the living environment that the chicken is in. The chicken is fed only organic feeds. Chicks must be managed organically from the second day of life. The pasture must be certified organic if the chickens will be one it. The bedding must be organic. Daily outdoor access must be allowed. Treated lumber cannot be used in building. It can be confusing when you go to the store and see the array of eggs before you. Some are brown, some are white, and some may even be green or light blue. To add to the confusion, there are free range, organic, cage free, and other phrases that can be confusing. Free Range: The USDA has not standard to determine free range and any egg can be labeled as such. Cage Free: This can include any one of three methods. Barn: The chickens have freedom to roam in a large barn area and may or may not have access to the outside. Free Range: The chickens may be in a barn or other shelter but must have access to the outdoors. Organic: Any one of the other two with the addition of requirements for organic eggs. Pasture Raised: This generally means that the chickens have had freedom to roam at will. Yard Eggs: These are eggs that may or may not be organic, raised by a small farmer or individual. Certified Humane: This is a relatively new term that mean that the producer has to raise the chickens in a certain way and comply with a certain set of standards. Buying free range, organic eggs does not guarantee that you are buying a cruelty free product. Many large poultry farms routinely kill male chicks. Sometimes this is done in an inhumane manner. The birds may be debeaked, the removal of part of the beak so that the hens won't peck at each other. Often the chickens are housed in crowded, long barns without windows.Organic does not always mean cruelty free. It means organically produced. For true cruelty free, organic eggs you will want to look for eggs that say organic and pasture raised both. This is why it is vital that you try to buy your eggs and other food products locally. Know the producers that you are dealing with and support those that follow the ethics that you subscribe to. One way to make sure that you get cruelty free, organic eggs is to raise your own chickens. It does not take much space and many cities allow for a couple of hens per household. Check with your local city ordinances as well as your homeowner's association to learn more.